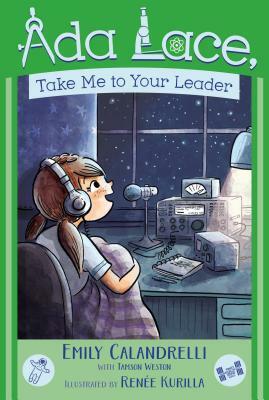 From Emily Calandrelli—host of Xploration Outer Space, correspondent on Bill Nye Saves the World, and graduate of MIT—comes the third novel in a fun illustrated chapter book series about an eight-year-old girl with a knack for science, math, and solving mysteries with technology. Third grader and inventor extraordinaire Ada Lace likes nothing more than to tinker with mechanics like her robot, George. Her latest project is to fix up a ham radio, something that she could use to contact people on this planet…and beyond. The only problem is that she just can’t get it to work properly. During a sleepover, Ada’s best friend Nina hears something strange coming from the radio in the middle of the night. A distant voice says, “Release the swarm!” convincing Nina that aliens are about to invade planet Earth. Could Ada and Nina have stumbled upon something…extraterrestrial? Emily Calandrelli is an executive producer and the host of Xploration Outer Space, where she shows viewers the most exciting projects in the space industry today and a correspondent on the new series, Bill Nye Saves the World. Emily has a technical background with mechanical and aerospace engineering degrees from West Virginia University and Master’s degrees in aeronautics and astronautics as well as technology and policy from MIT. Emily is a professional speaker and writer and is passionate about exciting students and their families about science and space exploration. Emily is also deeply passionate about getting more girls interested in STEM and STEM careers. She lives in San Francisco. Learn more at TheSpaceGal.com. Tamson Weston is the author of Hey, Pancakes!, illustrated by Stephen Gammell, and has over fifteen years experience in children’s book publishing. She works as a freelance editor and has edited books by acclaimed authors such as Adam Rex, Mac Barnett, and Dan Santat, among others. She has an MFA in writing and literature and enjoys running, biking, swimming, and lifting heavy things. She lives in Brooklyn, New York. Visit her at TamsonWeston.com. Renée Kurilla is an illustrator of many books for kids, including Orangutanka: A Story in Poems by Margarita Engle, The Owls of Blossom Wood by Catherine Coe, and the Ada Lace Adventure series by Emily Calandrelli. She lives just south of Boston with her husband, their fluffy orange cat, Timmy, and their spiky hedgehog, Lemon. Visit her at Kurillastration.com.